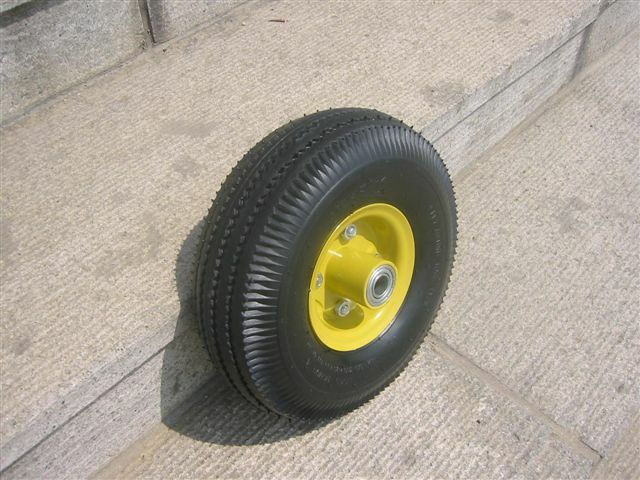 10”x 4.10/3.50 x 4, 4 ply pneumatic tire with inner tube, off-set steel rim with powder coating and ball bearings, loading capacity: 300lb. 10 pieces in a woven poly bag, Bag Size: 1,200 x 430 mm, N.W. : 15 kgs, G.W. : 15.5 kgs, Loading Quantity: 5,500 pieces per 20’ container, 11,000 pieces per 40’ container.